Master Niantic's latest free-to-play title with these essential tips and strategies. Much to the surprise of series fans, The Pokemon Company has recently released an all-new free-to-play game for iOS and Android devices. It's called Pokemon: Magikarp Jump, and as could be divined through the title, it focuses on one of Pokemon's most notoriously-useless creatures, Magikarp. There are a number of unique and unusual mechanics in the game, most notably including a hard limit on how much real-world currency can be spent, but players who properly manage their time and resources should be able to enjoy all that the game has to offer without spending a single dime. Read on to discover all that Pokemon: Magikarp Jump has to offer and discover the top tips on how to train Magikarp and start winning battles. Players who first boot up Pokemon: Magikarp Jump will be treated to the game's tutorial, wherein the player avatar arrives in a town that's become very keen on Magikarp jumping competitions. Unfortunately, competition has become stale, and the Magikarp themselves seem to have become listless and ineffectual. Fortunately, the arrival of the player has sparked the interest of the locals, and after being handed their first fishing pole, the player's trainer manages to catch their very first Magikarp. Once a Magikarp is acquired, the game begins to open itself up. Players will find themselves watching over their newfound catch in an aquarium of sorts, and can direct the Magikarp to consume food items that appear in the water. Doing so will increase the creature's overall Jump Points, or JP. JP is used to slightly increase the creature's level, and combined with proper training, is the primary way of moving up within the game's leagues. Training your namesake fish in Pokemon: Magikarp Jump is as simple as can be: players need only click the Training button. Note that doing so will consume one Traning Point, of which the player initially has but three, but these can later be restored through chance meetings and items like Soda. Selectring to train the Magikarp will bring up a new cutscene based around one randomly-selected training exercise, which is oftentimes the Sandbag Slam or the Jump Counter. Additionally, bonus JP may be accrued depending on the Magikarp's performance during that training session, with performance modifiers like Good giving small bonuses, and Amazing giving much more substantial bonuses. 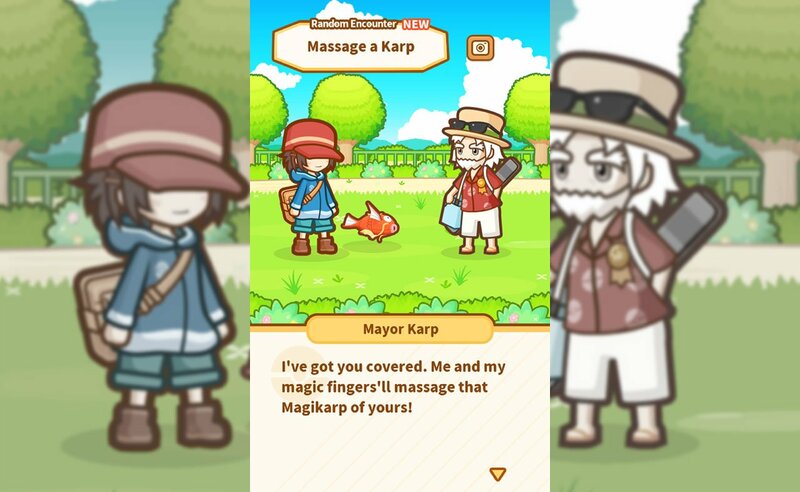 After the Magikarp training is completed, players also have a chance of engaging in a random encounter, which may result in a free Nugget from the Man of Mystery or even a magical massage from Mayor Karp. These encounters don't always happen, but when they do, players can expect rewards like coins or more Training Points. 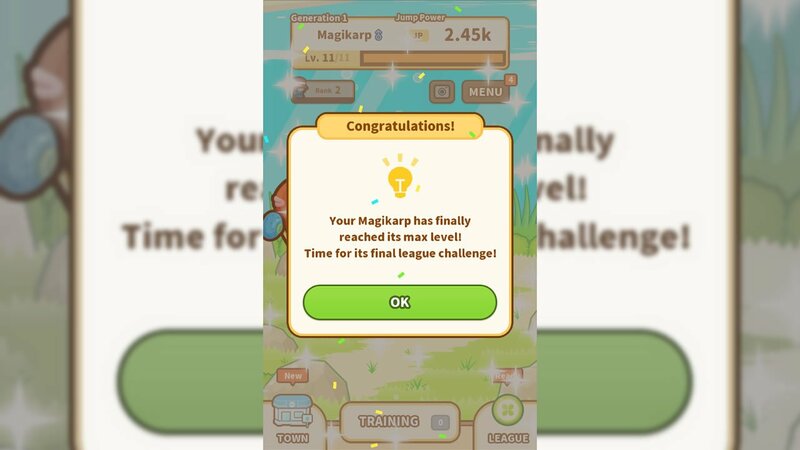 Eventually, the player's Magikarp will reach its highest level and will no longer be able to grow. Fortunately, this doesn't spell the end for the player, as training and battling Magikarp accrues experience that increases the player's trainer level. 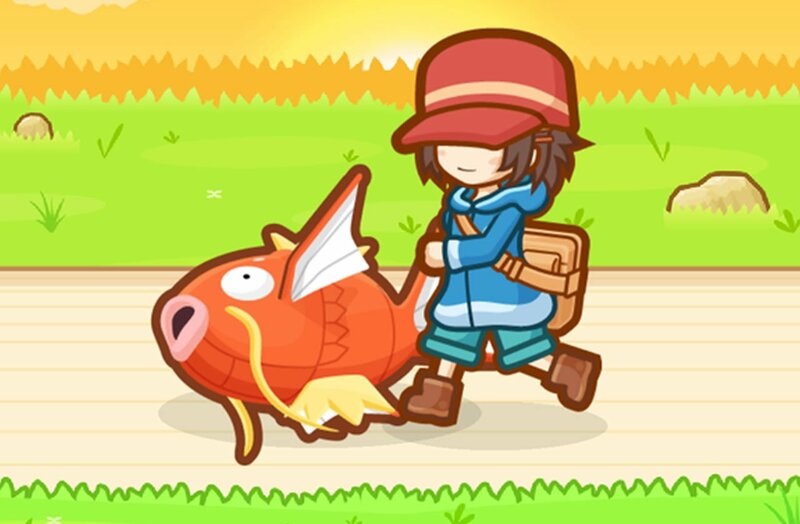 Each trainer level allows the player to capture Magikarp with a higher maximum level: for example, level 3 trainers can capture Magikarp with a maximum level of 13, level 5 trainers can catch max level 15 Magikarp, and so on. Players who conquer the game's initial Friend league will also likely find themselves earning other bonuses, like a +10% increase to Motivation, which allows future Magikarp to level up faster, as well as support creatures like Pikachu, who can bestow the player's creatures with various beneficial effects. There's much more Magikarp training and battling action to be found within Pokemon: Magikarp Jump, and players who stick to their guns and keep feeding and training can expect even more great surprises down the line. Looking for more great free-to-play games? We've got a number of great titles featured on our list of the Best Free To Play Games. Players can avoid the need for costly high-capacity storage by swapping out a few of the microSD cards they already own. Pokemon Go's Halloween festivities now include the chance to capture Hoenn region Pokemon like Sableye, Bannete, and others. The third and final chapter of The Banner Saga looks to feature the series' best art yet. Iron Maiden mascot Eddie joins the ranks of hard-hitting avians in the new Angry Birds Evolution Tribute to Iron Maiden.